ECORATORIO - An Ecological Oratorio: Now potted plants. Next what? Now potted plants. Next what? ‘In some cases, a solution is believed to have been found only after employees agreed to sign forms guaranteeing to take responsibility for particular plants. Many of those plants that were removed are believed to have been given to charities’ (wonder which charities are richer by several potted plants?). Is there truly the need for such a drastic measure? 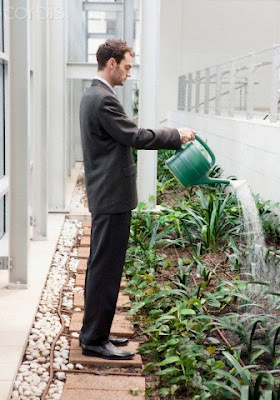 As is the practice in many offices, employees could have brought their own plants to instil some life in the workplace. Alternatively, employees could maintain the plants- one glass of water per day should suffice, I think. Nothing as demanding as playing with money. If Goldman Sachs is so keen on cutting overheads, I can think of a few measures which would also help the environment at the same time. But I wonder whether, in time, the bank’s purported CSR practices would be relegated to the backburner as part of these cost-cutting initiatives.